Aldo Sansone, commercial director at BolognaFiere Group, explains why next month's Bologna Licensing Trade Fair is set to be one to remember. And it's just not just due to the wonderful food. 60 exhibitors from Italy and abroad will attending this year's event. As preparations for the eighth BLTF get underway, BolognaFiere reports great interest in new Licensing Prospect Day initiative. Day aims to enable manufacturing companies new to the licensing sector the opportunity to meet brands exhibiting at the show. The only licensing event in Italy, last year saw exhibitor numbers grow to 2,500. Collectables firm attended Bologna Licensing Trade Fair to propose collaborations with existing children's TV properties. 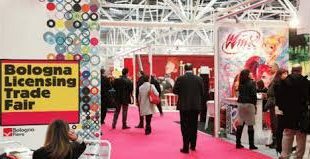 Kicking off on March 24th, the Bologna Licensing Trade Fair attracted just shy of 2,000 visitors last year. We chat to Cristina Angelucci from the organiser BolognaFiere about what we can expect this time round.